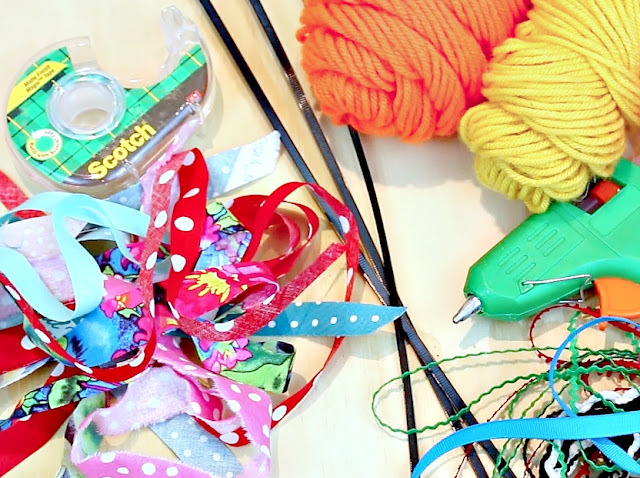 Grab your fabric scraps because we're taking the DIY train to tassel town! I raided my scrap box (okay, it's more like a warehouse) and made colorful tassels and then attached them to a funky bracelet. Now you might want to hang them on a doorknob, attach one to a skeleton key or your keychain. 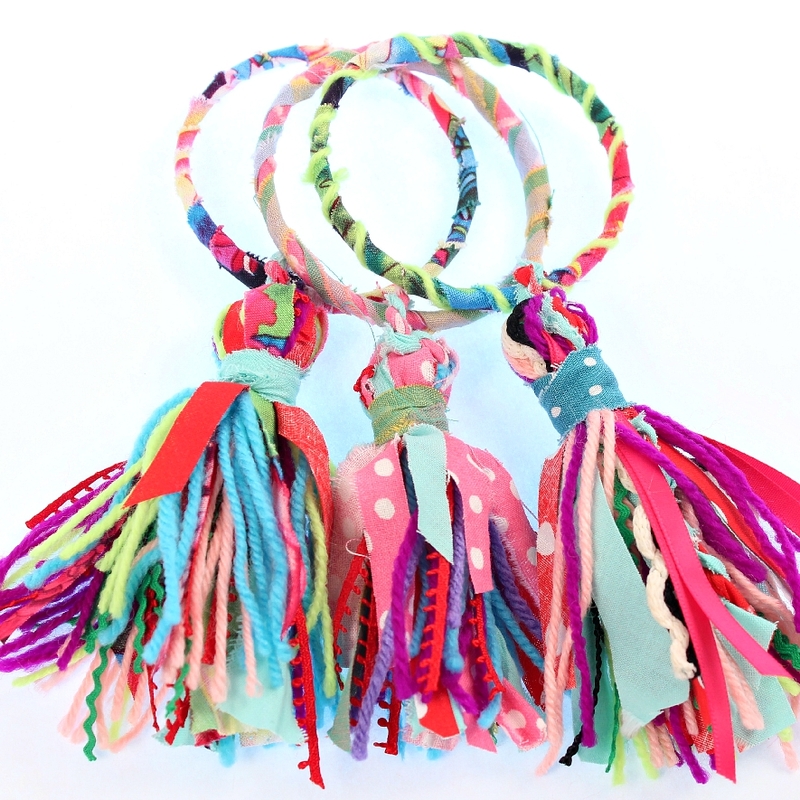 Whatever you decide to do with them, I promise these little tassels will make you very happy! See how I made them here! That's the nicest thing anyone has ever said to me, Anne! I find that the minute I toss something an idea pops into my head and I always regret throwing it away.......Ugh! Crafters are hoarders and we just have to come to terms with it. Thanks for the post, you're awesome! oh my gosh, that's the truth. I am now ruing the major fabric stash give away this summer!!! Hey...I wanted the fairy stuff, but I will take the bangles! Your awesome, love all your projects. This is awesome, love all your ideas . Love Love Love!! Thanks for sharing! 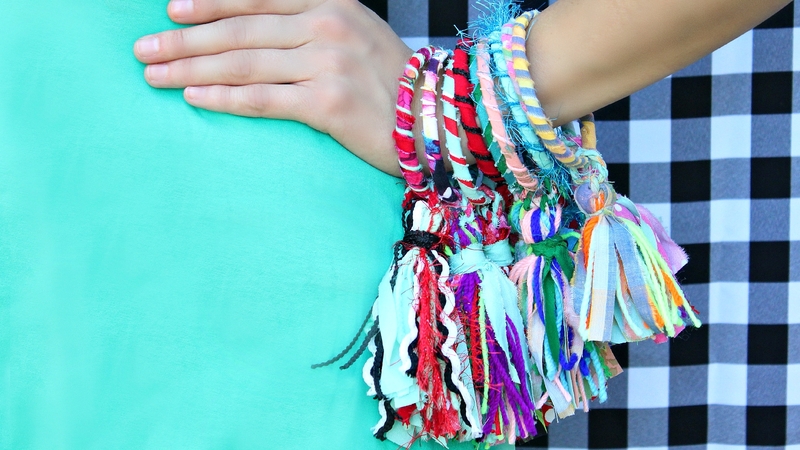 really want to win one of these bracelets !! These are wonderful!! Hmm...I seem to remember some ideas flying around about tassels this summer, these are a great new "play" on the traditional! Love them on bangles! 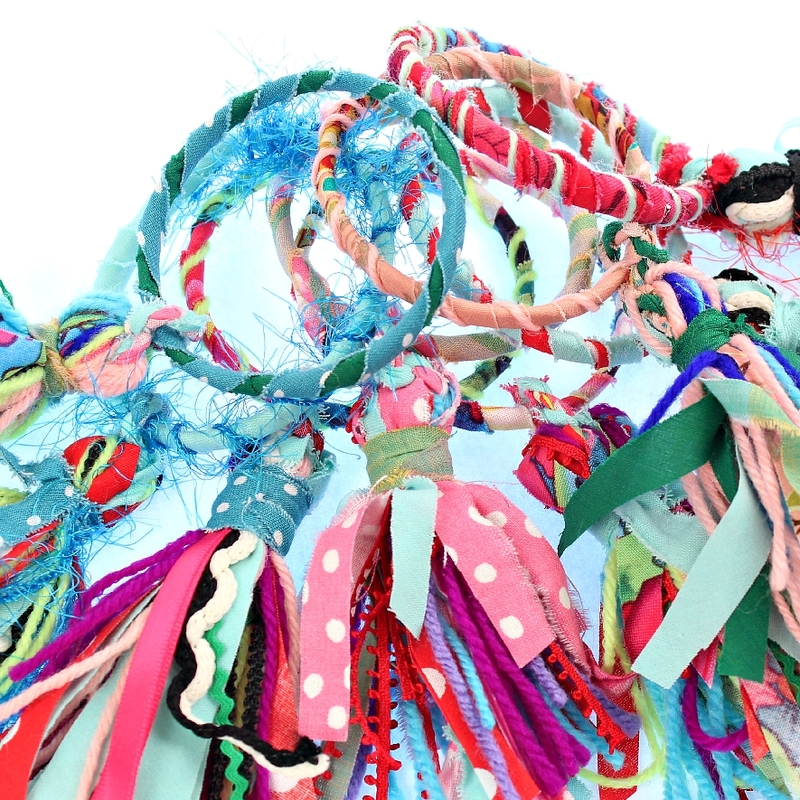 Have a few of your funky bangle projects with embroidery floss tassels! Those are super fun too! What a kick these are! Julie is a great addition! Cray cray, but gee who isn't just a tad cray cray? 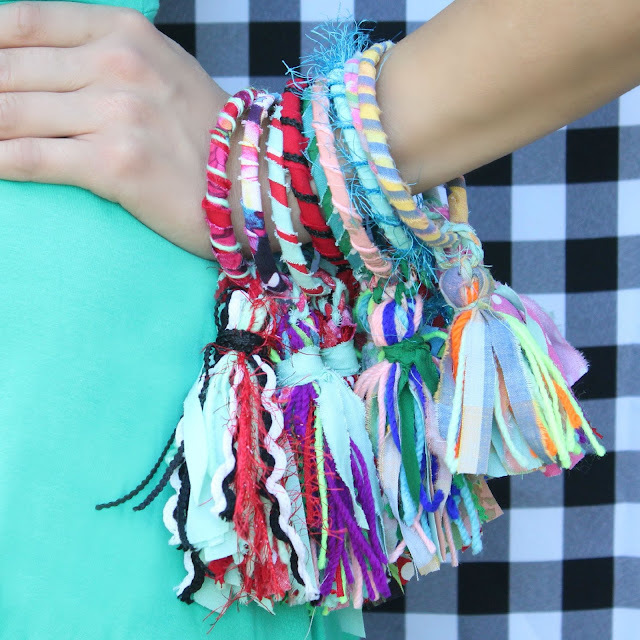 These bracelets are awesome. My granddaughters would love them. Hope I win. Love the colors also. Reduce, reuse, recycle, upcycle, create! You are my brother from another mother! These tale bangles are awesome! Love ya mark! Granny Rho! You won the bangles! Please send me your mailing address, OK. You can send it to me personally at MarkMontanoNYC@aol.com. Congratulations! Thank you thank you! Just emailed you! I'm so excited! 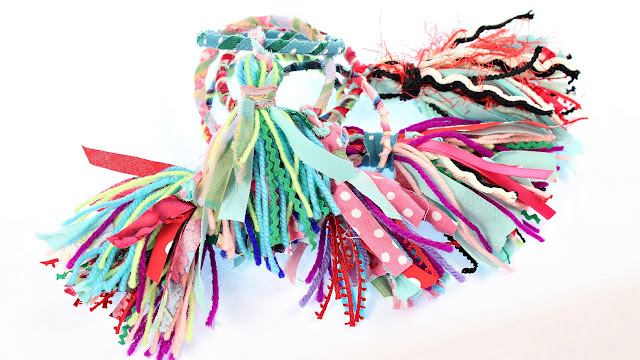 These are so cute and justify my reasoning not to get rid of anything- you can always make something from whatever you have lying around- my craft area is full of things like this just waiting to be transformed!! They do give you that happy feeling! Oh Mark, loving you and all you she with us, My Friend! I would love to win one of these amazing bracelets. Thank you with love! Love the tassels! I am going to make some to add to a handbag I am making. Thanks! Any reason to use up stash is a great idea. Thanks Mark! Hey there...love the bangles. Such a cute, fast and fun idea! Just "Stumbled" across this! LOVE IT!! Back To School Art Jar! Fairy Dolls DIY and Clutterbug Collab!